1. Bring both hands together as if you’re filling water in them. 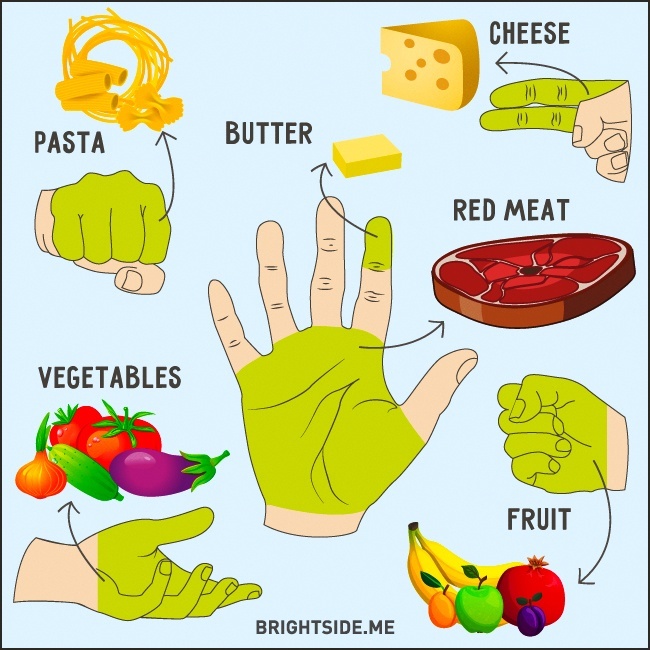 Instead of filling water, measure how much veggies fit between your hands. That’s how much veggies you need in one day. 2. Make a fist. See how big is the area of your twisted fingers. That’s how much carbs (bread, rice, pasta, cereals) you need to eat in one day. 3. The size of your palm, without your fingers indicates the size of the meat you need to eat in one day. 4. Tight fist equals the amount of fruits you need throughout the day. 5. To measure how much cheese you need throughout the day, measure your index and middle fingers. That’s how much cheese you should slice. 6. The tip of your index finger is the amount of butter you can eat. Keep in mind the daily portions for different food items and divide them into three parts — breakfast, lunch and dinner.